Be a part of our Red Kettle campaign and help those in need in your community by volunteering to ring a bell for as little as two hours. You can volunteer to ring at your local Publix, Winn Dixie or Walmart location. The Salvation Army begins ringing on November 8 through December 24 from 10 am – 8pm, with no ringing on Sundays or Thanksgiving. Simply sign up for a date, time and location that is convenient for you. A kettle with your name or your group name will be waiting on you at the customer service desk. You will also receive a box containing a bells, apron and important contact information. If there is already a ringer there, just let them know you are the next scheduled volunteer. Then, start ringing, with a smile and wish shoppers a “Merry Christmas.” Don’t forget to thank people for their donation and most of all WEAR COMFORTABLE SHOES. How long should I ring? Volunteers can sign up for a minimum shift of two hours. We encourage volunteers to take four hours or more to help The Salvation Army manage sites and volunteers more efficiently. To make it even more fun, we encourage you to find someone to ring with you. Most kettle sites have limited space. Groups of more than three people may intimidate potential donors. Except in special cases, no more than five people may ring at a kettle site at one time. Is there an age requirement for bell ringers? Families tell us that bell ringing is a great way to instill a sense of community spirit in young children. 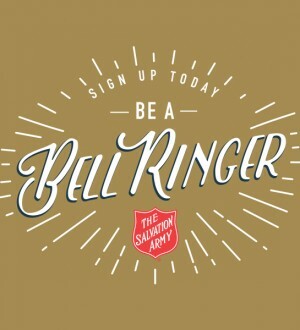 While anyone is invited to join us as a bell ringer, kids under 16 must be accompanied by an adult. Yes, it does. If you would like to schedule community service hours, indicate this in the notes or comments field when you select your shift. Kenya Bell, Kettle Coordinator will provide you with a letter for your service. Email kenya.bell@uss.salvationarmy.org with your name and address. Can I give out Christmas treats to shoppers? As part of our agreements with the stores, we are not allowed to give out items or promotional materials at kettles. We ask that while you are volunteering you do not give anything such as candy canes, flyers or other items to shoppers. Who should I contact if I have questions or to sign up? Call our Kettle Coordinator Kenya Bell at 904-301-4852 or send her an email at kenya.bell@uss.salvationarmy.org. Or just click the "sign me up" button and that interest form will go to Kenya.